LOS ANGELES—In an effort to improve riding conditions for the city’s long-neglected bikers, Los Angeles officials announced Friday a $10 million plan to add lanes for cyclists to recover from getting hit by cars. “L.A. has fallen short of bike-friendly places like Portland and Philadelphia for years, which is why the City Council voted today in a landslide 11-0 decision to finally create a bright green pathway where you can get doored and safely roll around, clutching your knee and writhing in unbearable agony,” said mayor Eric Garcetti of the Department of Transportation initiative that will provide cyclists with four feet of space on all major Downtown streets to look in horror at compound fractures, check for concussions, or simply lie motionless on the cold ground and bleed out. 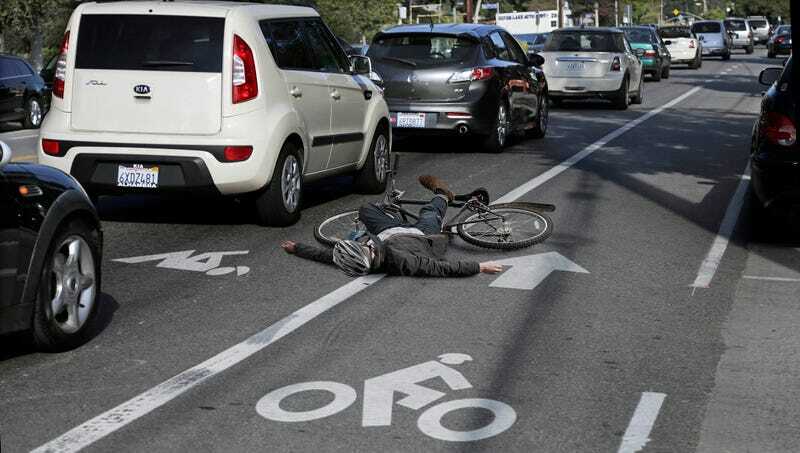 “Countless accidents occur every day because of our poor cycling infrastructure, reckless motorists, and many other factors within our control, but luckily Central L.A. will soon have miles of road fully dedicated to letting riders regain consciousness from these collisions. Never again will you be side-swiped, rear-ended, or cut off by a distracted Uber driver without having a place to tend to your wounds.” At press time, the Los Angeles City Council voted to add a new lane where cyclists could recuperate from the countless additional injuries suffered while recovering from their original ones.